Long time no talk. I hope everyone who is reading this has had a relaxing, enjoyable summer! Our family has been working hard on not overscheduling and having plenty of downtime, which is a real treat compared to my norm of packing as much into a day as possible. Wilson is absolutely thriving– up to the 60th percentile in weight and still something like 98th for height!– and I was able to get a full milk supply back (although I had to give up eating dairy, soy, gluten, wheat, egg whites, tree nuts, and basically anything tasty in order for Wilson to be a happy camper). 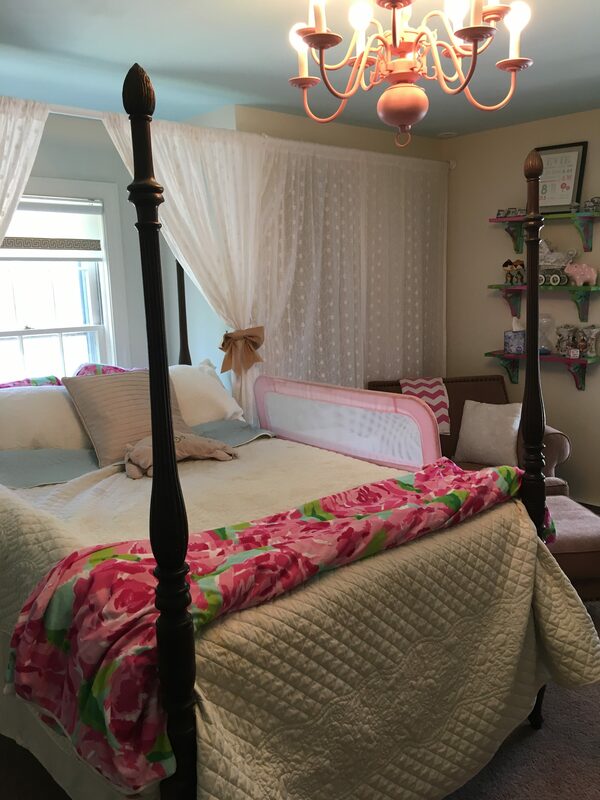 Things are still happening around the farmhouse though, so I figured I’d take a minute to give you an update on Evie’s new Big Girl room! Awww, and below is a picture of Baby Evie in her changing table, nearly 3 years ago. WHOA how did 3 years just go by?! 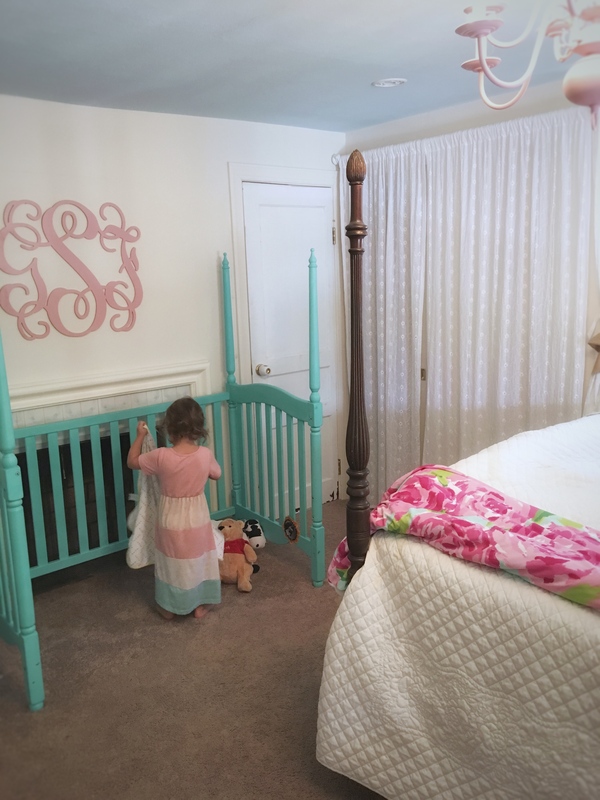 Evie decided she was ready to be potty trained in June and out of the blue made the decision to stop wearing diapers, so we had no more need for a changing table in her room. We decided to take it out and put it in the guest room, aka Wilson’s room for now, but that left us with a big open space in Evie’s room. This coincided with the time she decided to start sleeping in her Big Bed, a bed that belonged to my great-grandmother (Genevieve), grandmother (Genevieve who went by Jane), and aunt (Jane), and now belongs to Evie. So we did some rearranging and she has a whole new, Big Girl room fit for a Big Girl Genevieve! 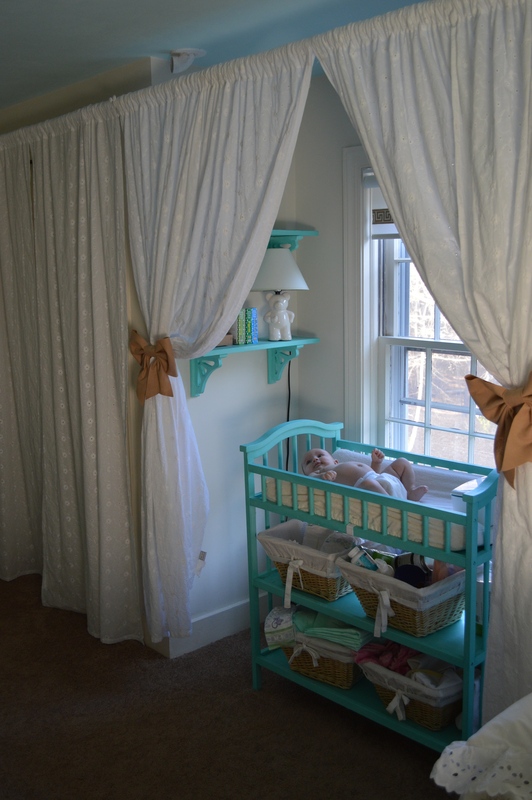 We moved the bed to the nook between the two closets where the changing table used to be. Evie’s Big Bed has a pool noodle under one side of the bed and a regular mesh bed rail on the other side. (She sleeps on the side with the pool noodle and puts a million pillows between her and the actual noodle, and the mesh bed rail is just there for my sanity hahaha. 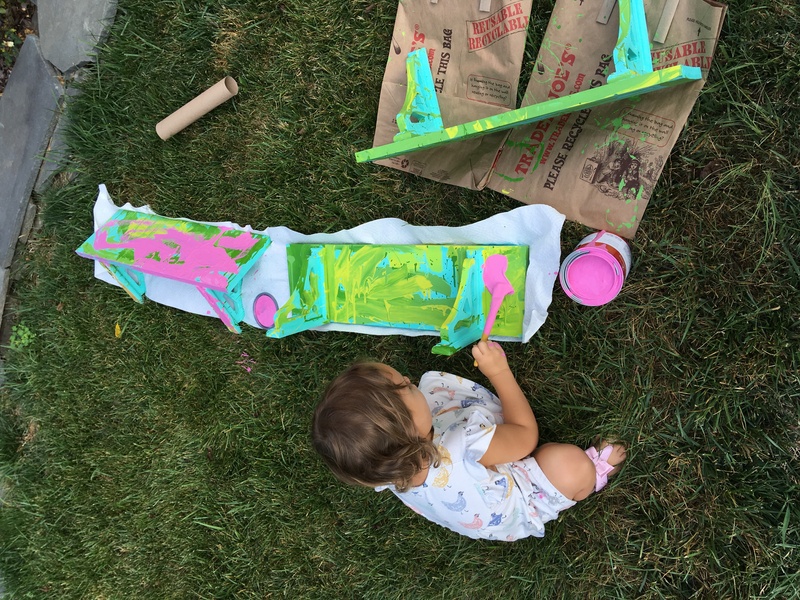 Evie and I went to the paint store with her new blanket, a Lily Pulitzer-style one from Etsy, and color matched the flowers and leaves. Then Evie went to town doing whatever she wanted on the shelves with those paint colors! 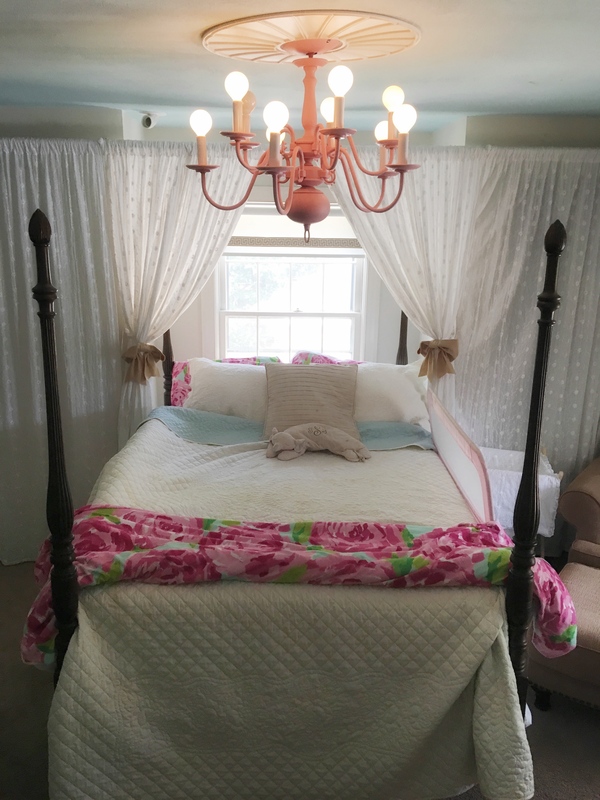 I like how the headboard and two posts are tucked behind the curtains. It kind of gives Evie a snug, tucked in feeling when I leave her room at bedtime each night. We could move the bed about 2.5 feet closer to the window behind it but there is a baseboard heater there so I’m not sure it would be good for the wood. We removed the crib mattress and fourth side of the crib, and now the old crib is Evie’s staging area for her toys as well as an EXCELLENT fort location. Overall, Evie’s Big Girl Room is working out really well. I can’t believe I have an almost-three-year-old who doesn’t need a changing table and is sleeping in a big four poster bed, but if she’s got to grow up so fast, at least I like the room she’s growing up into. 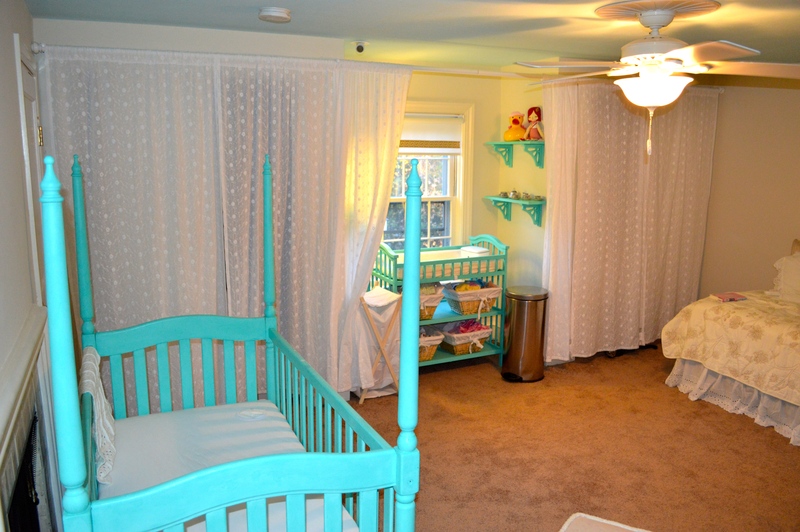 Later this week (hopefully I’ll get around to it) I have to share how the hallway between Evie’s room and her new bathroom turned out, and the finished laundry room too! 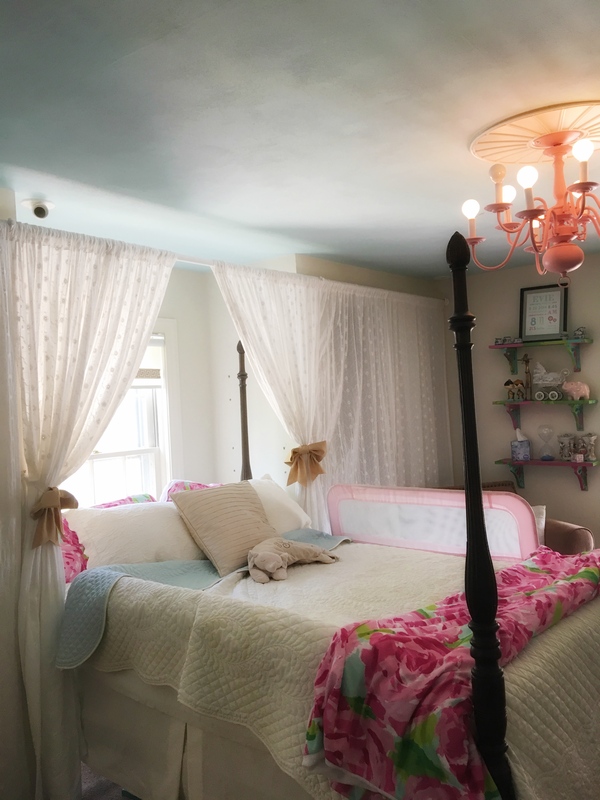 The big girl room is fit for a princess!! If course, Evie always was and will be the princess in that Sade household. I’m thrilled to hear Wilson is thriving. You are both awesome parents. 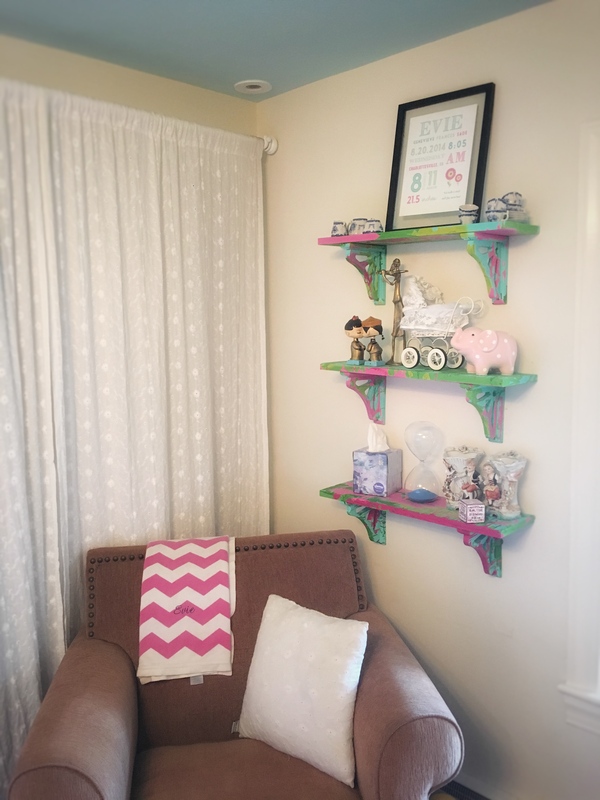 I love the paint job Evie did on the shelves. Everything came together beautifully. Keep up the great work. Love all of you. Thanks Aunt Bette! She is a princess indeed, and we are blessed to be her royal subjects. 😉 Hope all is well with you!! Just precious. Like “miss evie” !!!! So happy to see her painting too. 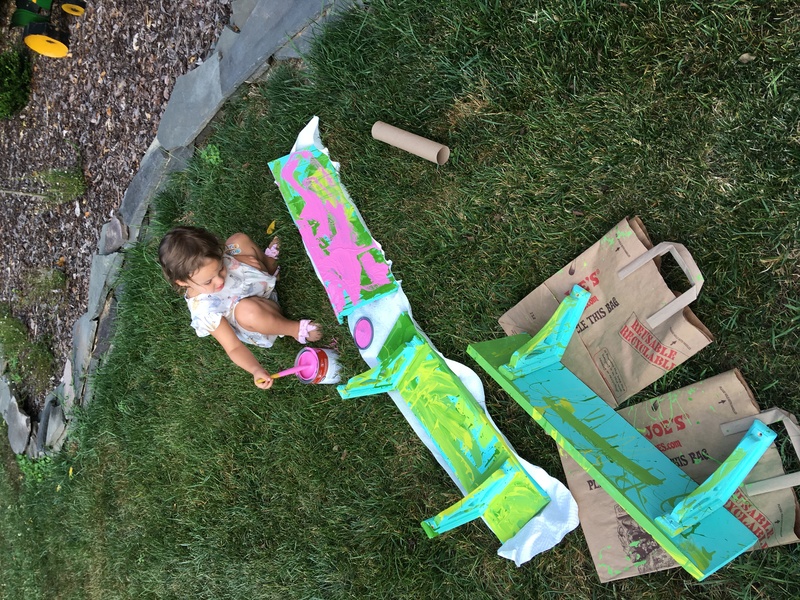 Very creative, just like her mom !! !Love it. Job well done.